This tag is in honor of a friend who’s started to collect Copics – but not for shading. It’s a super easy way to add color and make it look like you “meant” to go simple! Today’s tag only needs ONE Copic marker. Yes, ONE! Instead of making it a heavily-colored tag, try just highlighting one portion of each image. When the stamp set is as adorable as Dairy Christmas , it’s easy to let the humor take the stage! Watch the video below or click HERE to see it in HD on YouTube. 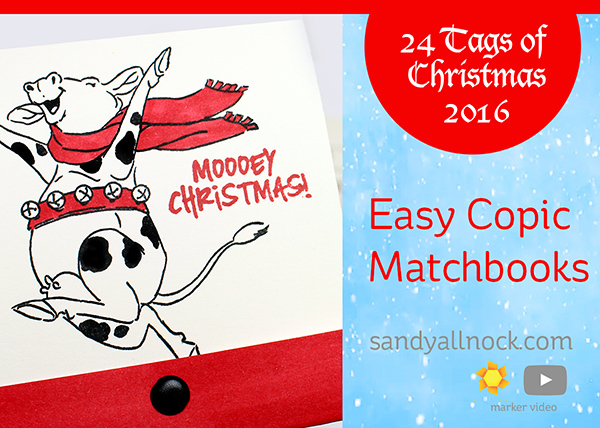 You can use these just as tags – or as a delivery system for a gift card! Glue Dots, 3/8″ —- to attach a gift card inside. So much fun!!! These little critters are so joyous! Thanks for the chuckles! Very fun images. I love the matchbook idea. Beautiful work, as always. One color challenge! Love it…at times I use a limited pallet but this is so clean it’s perfect! Thanks, Sandy. OH MY These images are so cute and love the simple look. Great idea only coloring a little vs. ALL… Love them. They are so funny and cute. I love this idea for a gift card. Some ideas are just to confusing and this is simple and sweet and I love them. I’ve been really watching your videos as I struggle with the shading in coloring! I’m starting to think this simple coloring is just as effective for me and can look just as cute. I love that stamp set though!! Who knew …….matchbook tags and so so cute. That dancing cow is a scream. I love your tags and I love this idea! Such a great idea – no shading, just cuteness! What a fun set of images. Like the one color also. I’m in love with these tags, those stamps are incredibly cute. You are so talented!!! LOVE the idea of one color. Your closure technique on the matchbooks is great. I always wondered how to do that. Love the monocolour thing! Great idea! I love these! Art Impressions has such fun stamps. I love the idea of just using one color, quick and easy! Love the livestock! Thanks for all I learn from you with each post! You’re the bomb! Great idea to make these matchbooks. Adorable! Love the idea of making a matchbook tag. These images are so whimsical and funny, thanks. I love the idea of matchbook shaped tags. This stamps set is so funny, love it. The dangling part on the chicken is a wattle. So cute! I will definitely use the idea on using one color on some tags. You make it look so easy! Those are so cute! I’m guessing that there was no bleeding thru the paper because you didn’t do any blending? Awesome project as usual ~~ thanks! Love the idea of making the matchbooks. Super cute design – gotta try that one. Great idea! I love Art Impressions! Love Art Impresins stamps and these are no exception. Adorable. Great idea to do tags that fold up, a bit different to just straight one layer tags. You’ve done it again Sandy, cute and fun stamps. Will try this one out. Great idea, I am going to give this a try myself. I also want to try it on a card, thank you so much for sharing this! These are so stinkin’ cute! What a great way to make gift card holders quickly & still with a personal touch. Beautiful tags Sandy and great video thank you for sharing. I would love to receive these tags and gift them to my loved ones for Christmas. Thank you for giving us the opportunity of getting them in the giveaway. Keep up the good work!!! Fantastic idea for gift cards!! So very cute! This stamp set is a must have. Being a kiwi stamps with cows are awesome as we have have sunshine at Christmas time, love all the wee tags though, they all adorable! Cute tags! The stamps are really cute and I love how you made them matchbooks! The cow just cracks me up! Haha. Cool idea, only using one color to highlight items! Love your tags!